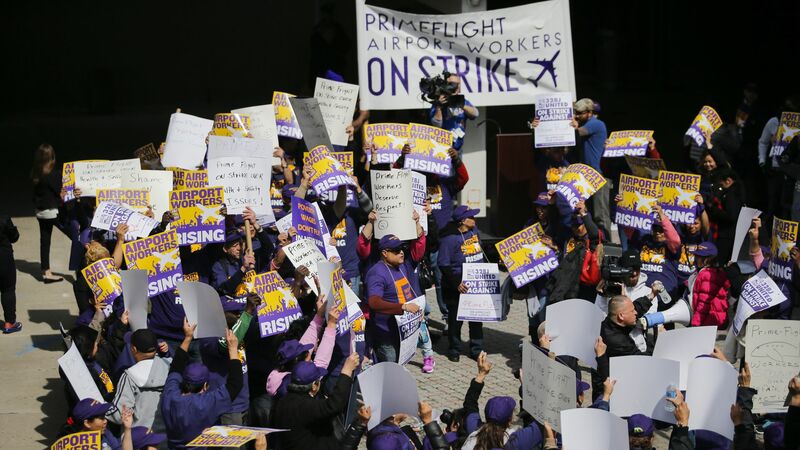 About 40,000 workers, including baggage handlers, cabin cleaners and caterers, at three New York-area airports will see their minimum wage jump to $19 an hour by 2023 after years of protests and pressure from the unionized workers. Why it matters: This increase, approved on Thursday by the Port Authority of New York and New Jersey, is beyond the $15 minimum wage in several other large cities and is expected to be the highest set by a public agency in the country. The details: Employees at Newark Liberty Airport in New Jersey, who currently earn about $10.45 per hour, would be the biggest beneficiaries of the phased-in hikes because of the differences between state minimum wage laws. The wage for workers at Newark will increase to $12.45 an hour on Nov. 1, followed by annual increases over the next five years. Workers at John F. Kennedy International Airport and LaGuardia Airport in New York currently earn at least $13 an hour. Their wage will jump to $13.60 in November and gradually increase each year. The Port Authority, controlled by the Democratic governors of both states, said the increase would boost workplace morale, productivity, and slash staff turnover rates which have increased by 50% since 2010. The other side: A spokesman for Airlines for America, a trade association of U.S. airlines that opposes the wage hike, said the group complies with all state minimum wage laws. However, he argues that the Port Authority has exceeded its legal authority. "Picking winners and losers and creating a patchwork of conflicting and confusing wage rates is not just bad policy, it amounts to one more backdoor tax that airline customers don’t want to pay." — Spokesman Vaughn Jennings, told Axios in a statement.